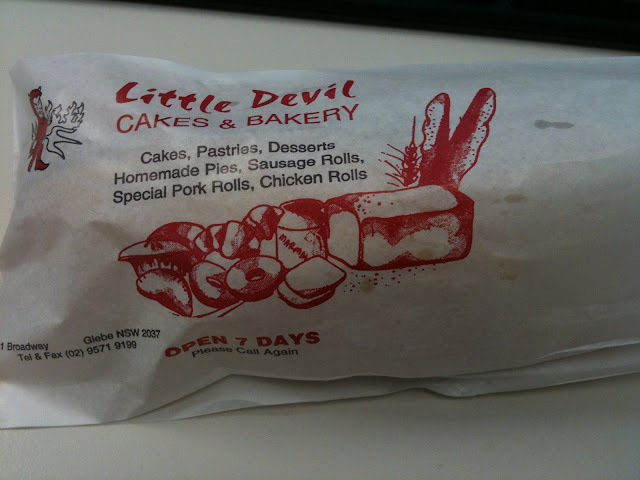 As banh mi seem to be the flavour of the week (at least mini ones are), Little Devil Bakery at Broadway caters for a quick fix. 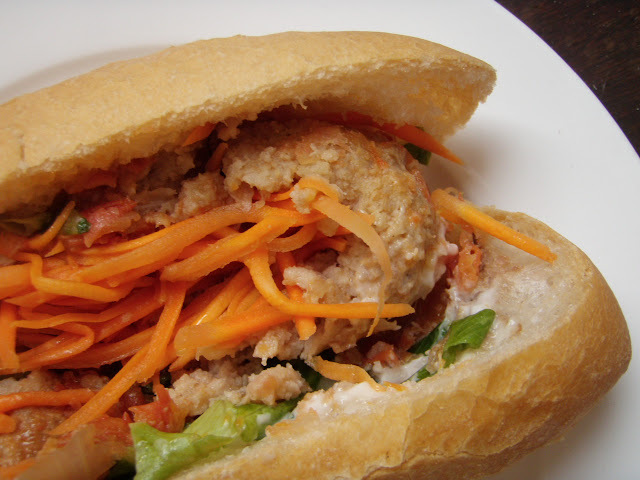 I first tried banh mi around 1993 when working in Campsie, making a daily trek to a stand in the big shopping centre off Beamish St, and got hooked on the spicy, crunchy, soppy combination of chilli, pork, bread and sauces. Nearly ten years later Shawn and I had what is still the best roll ever, from a morning roadside stall in Siem Reap, Cambodia. Lightly toasted and hot off a little charcoal griddle, the pate melted into the bread and the taste was sensational. 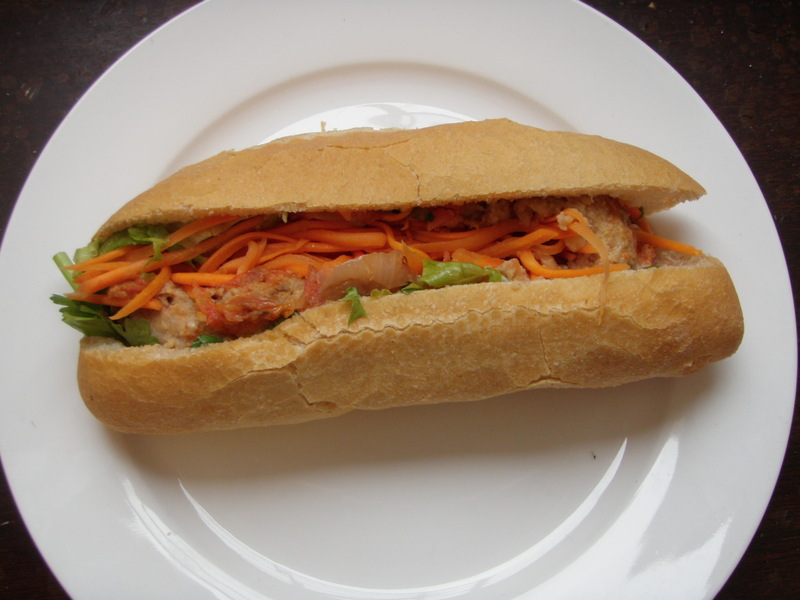 We’ve since had banh mi in Vietnam, the best one not a pork roll but stuffed with a peppery omelette and hand delivered by an enterprising young man, who whipped them up for US$1 each when we were stranded between Hoi An and Na Trang on a train cut off by floods. Closer to home is Little Devil Bakery on Broadway, perfect to duck out for a quick tasty lunch. They do a thriving trade in pork rolls, as well as salad and chicken rolls (and a great chocolate mud cake for office birthdays!) It’s the only place I know in that area that does them. The bread roll is crispy, the balance of vegetables (coriander, carrot and onions) makes it refreshing, and remember to ask for chilli as they might assume it’s not for you. A good mix of different pressed and roasted pork slices, and a lighter hand with the pate. The sauces were lightly done, so that the roll didn’t get too soggy by the time I ate it about 15 minutes after it was made. Your hands will need a good wash after you eat from the lovely fish sauce and seasoning combo that oozes out. A bargain at only $4.00. They also do a meatball version for $4.50. The meatballs are oversize balls of pork mince in a pasta style tomato sauce, hot out of the pie warmer. They sit amongst the standard salad on a roll, and get a bit squished down to make the roll close. You still needed a wide bite to get through it without the meatball oozing out the side (otherwise you'll need tissues and lots of 'em.) A great alternative to a Subway meatball sandwich. Little Devil also serves up your usual pies and sausage rolls, and some ready made rice paper rolls for a healthy grab it and go lunch. If you want a balance to the healthy stuff, they have a big range of cakes too. Little Devil Cakes and Bakery is at 231 Broadway, Glebe. As the bag says, open 7 days. They normally have a small time closed at the start of every year. I have never seen this place but probably because I'm not a big fan of Broadway. 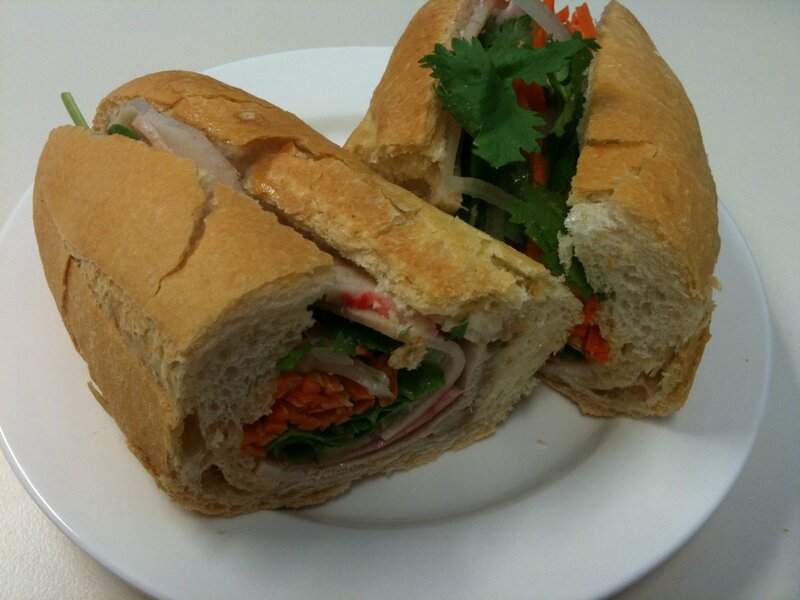 Looks good and cheap for a quick banh mi. Drool. Why is there nowhere in Parramatta that sells these? I'm going to Little Devil for lunch this week me thinks....and I'm going to try a crazy Happy Lemon drink too. Ahh I love a good pork roll - for breakfast, lunch or a snack. It's not the same unless there's a good glug of Maggi seasoning too. I didn't know this place existed, but glad it does cause the food in Broadway shopping centre is a little meh. 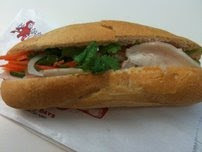 I'm heading to the shopping centre next week, so I'll give this pork roll a go! This is so so good! Love it and cheap too. Now to try the meat ball version. It is not in broadway shopping center but along broadway main road. It's just a little further up broadway shopping centre and next to either a bottle shop or Kelly bookshop.